Gilbertsville Farmhouse is an idyllic goat farm and event venue nestled in a tiny historic village in Otsego County, which is in Upstate New York. The village of Gilbertsville is part of the town of Butternuts. This venue specializes in full-fledged wedding weekend events, so be sure to check it out if your dream wedding is one where guests can gather, celebrate, and relax for a full weekend on 125 acres. This is the perfect spot to hold destination weddings. 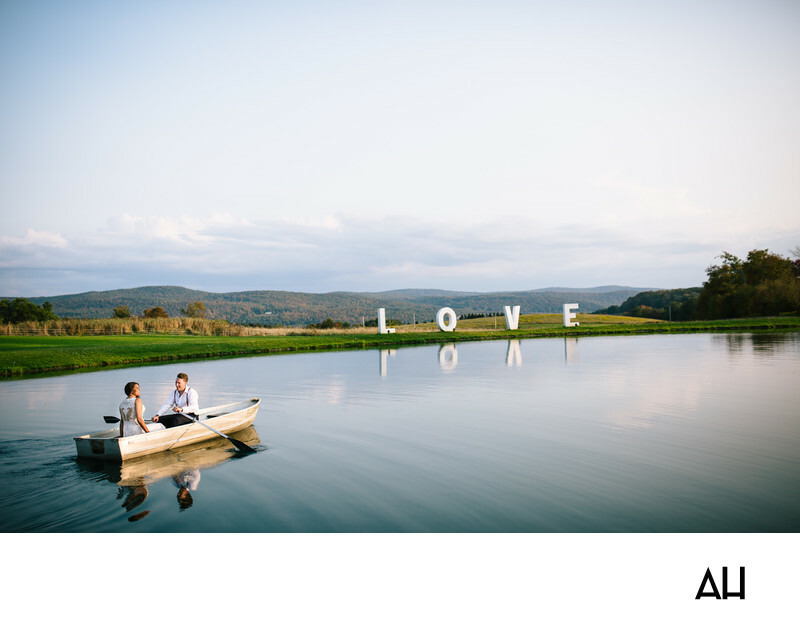 Everywhere you turn there are stunning photo opportunities… from this large pond (L-O0V-E prop letters are included! ), antique pickup truck parked on the front lawn, the house, and barns. Inside there are more perfect props – wood stoves and antique sofas. Outdoors meandering roads lead through farm gates and on past twisted trees and pastures. And of course, in the background of it all are the sweeping Catskill mountains making it one of the best wedding venues in upstate NY. Choose between an open meadow and a forest clearing for your ceremony, with venue-provided antique church pews adding charming seating. And there isn’t just one barn – there are two beautiful antique barns. The smaller milking parlor barn serves as a lounge area, whereas the larger barn provides the main reception space. There is no on-site catering, but there is a full caterers’ station available to ensure your food gets served hot. The Farmhouse itself has four bedrooms and may be rented for use by the wedding party. The Gilbertsville team is also very proud of its popular glamping site, made up of ten luxury glamping tents. Each one comes with a wood-burning stove and plush king bed. A communal central bathhouse includes a lounge area. If you find yourself with a quiet hour, find your way over to the Hammock Park, which is exactly what it sounds like – a collection of hammocks hanging in the trees. And even more fun, the Gilbertsville Farmhouse offers goat yoga classes – relax and ease wedding-nerves surrounded by playful baby goats.